Because she is marrying the man who became Santa Claus last December 26th, Beth’s postponed wedding has to be rescheduled for Christmas Eve. Overwhelmed by selling the house she and her son share, and the prospect of the duties of Mrs. Claus, she has to call on her estranged socialite Grinch of a mother to arrange the wedding. …When are you people going to bring a genuine “Christmas’ movie??? and making it into some kind of love story. Like, on again off again and then getting back again. Get real, it’s boring. The US was and is a christian country. My children are not allowed to put on christmas pageants, or say a prayer in school, yet the moslems are provided with a special prayer room. Are you people blind????? They’re taking over Europe and soon other countries. And, you , and so many others are still catering to these people???? Remember , they need us , we don’t need them. If you’re unaware of all of this , listen to “FOX ” news , they will enlighten you, just in case you’re ignorant just like so many others in this country . For God’s sake , wake up and take a stand . Stop showing these boring movies , under the pretence that they’re Christmas movies …well !!! I love this movie and have wanted to purchase it since it came out. Please consider releasing this on DVDS. 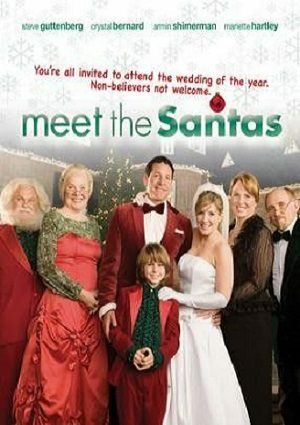 why isn’t Meet the Santas on DVD?